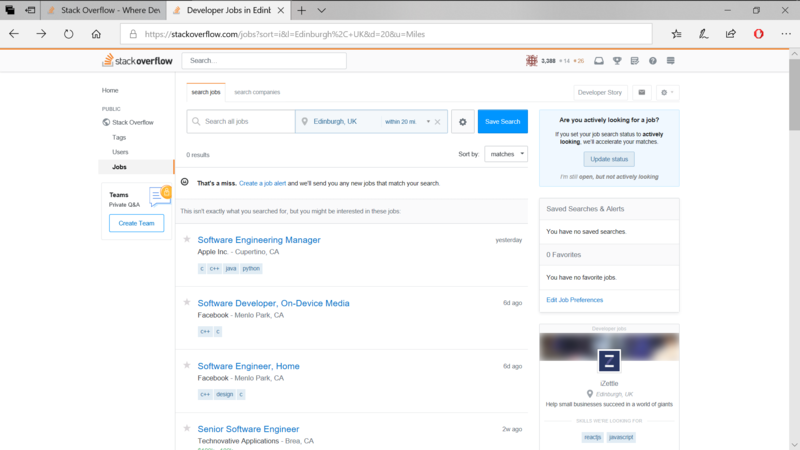 Visiting Scotland (from the US) I searched for jobs within 20 miles of Edinburgh, UK and got an empty result (see the screenshot below). It seems unlikely there are no jobs in Edinburgh. In fact, in the lower right corner of the screenshot one can see an advert for a job with iZettle in Edinburgh. It is of course possible that this is operator error, or a consequence of moving my laptop from the US to the UK. I'd assume the reverse: it's possible that there are currently no available jobs opening in Edinburgh, UK. The ads you see is iZettle, a company having offices in both Edinburgh, UK and Stockholm, Sweden. However, the job they're currently offering is a web developer based in Stockholm, Sweden. Searching for companies named iZettle within 20km of Edinburgh, UK returned the expected result though. Not the answer you're looking for? Browse other questions tagged bug jobs search .